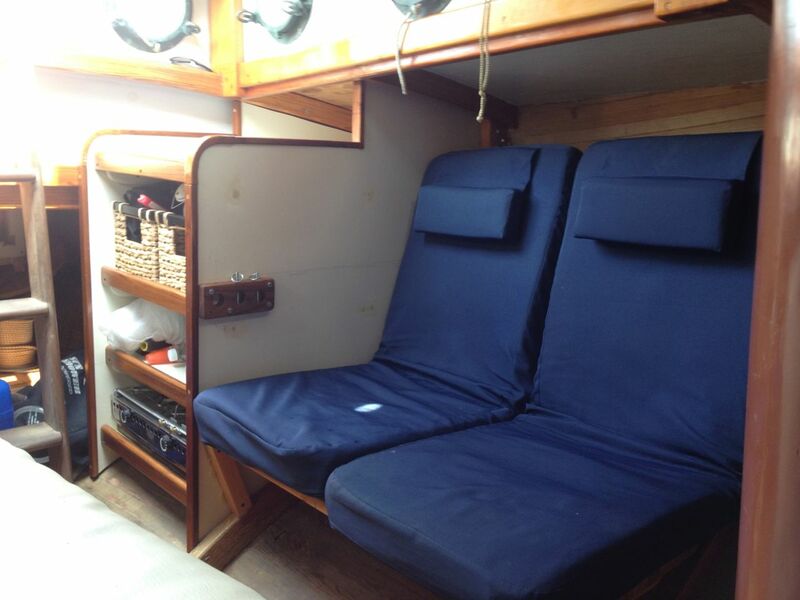 The next step in the project was to build a new bunk. I tortured myself over this bunk more than any other part of the job, mainly because it seemed so 'out there'... so different from accepted norms... so... old fashioned! My main reason for choosing a root berth as my second bunk is that it rolls out of the way when not in use, clearing the way to the foc'sle where I wanted to keep the head, storage for ropes, fenders, extra sails, etc. Also, it was cheap to build and -- according to all reports -- a very comfortable berth. A root berth is different from a traditional pipe berth because it only uses two pipes -- one on each side of the bunk -- rather than a closed frame. 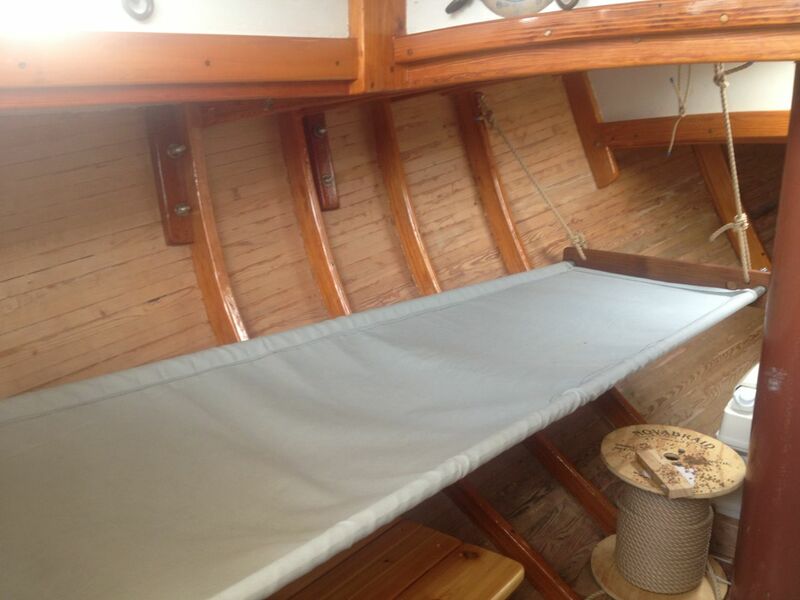 I would have actually preferred a pipe berth, but it would have been either two narrow to sleep on, or too wide to fold up against the side of the hull. Believe me! I measured that space at least 148 times. 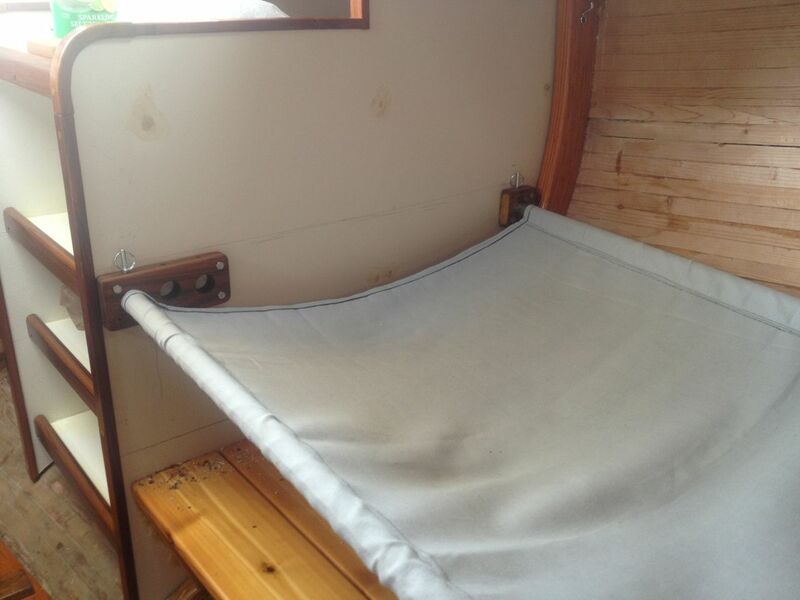 I wasn't quite sure how to sew up the cloth part of berth itself, so I bought some cheap canvas material at a fabric warehouse, and just went at it. As I always say, you never know how to do something until you've done it, so don't let a lack of knowledge slow you down. Just dive in head first and figure it out as you go along. To keep things simple, I decided that the in-board pipe (the one I'd climb over to get into the bunk) would be perpendicular to the galley bulkhead. Likewise the foot stretcher would be parallel to the bulkhead. 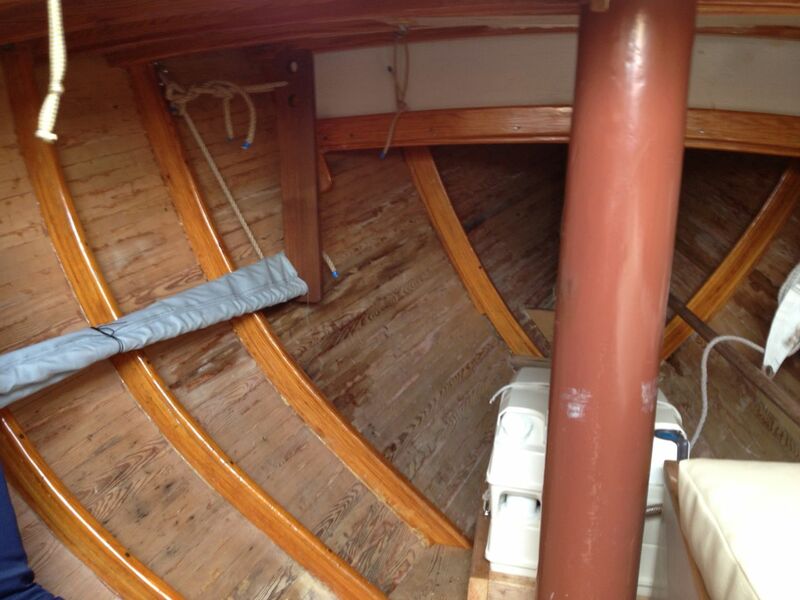 The out-board pipe (the one closest to the hull) would run at an angle along the side of the boat. At the head of the berth, the pipes would be 28" apart. At the foot, they'd be 18" apart. Allowing extra material for the pipe sleeves, this made marking off the berth pattern fairly simple. 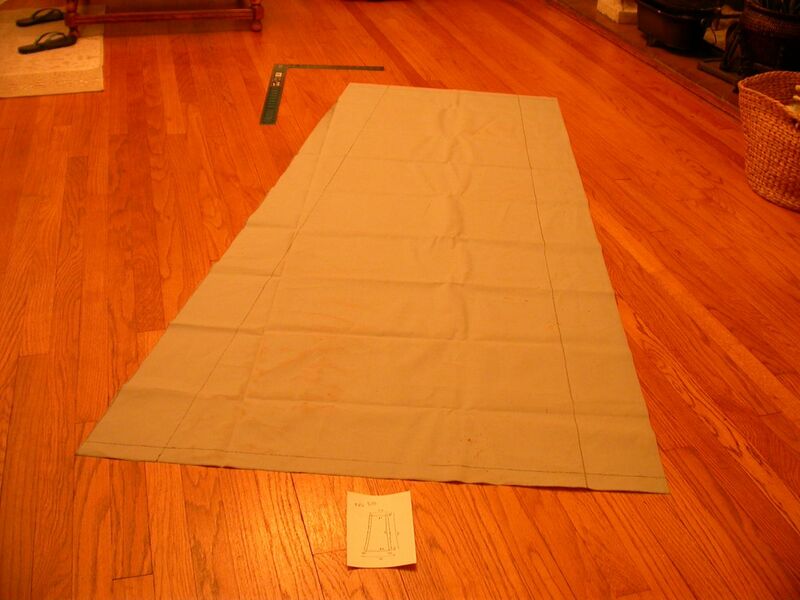 If you click on the photo below, you will see the allowances made for hem at head and foot, and for sleeves on either side. The little scrap of paper at the head of the berth is my 'plan'. Obviously, I didn't over-think this one. The outboard pipe came into the head chock and foot stretcher at an angle (about 9 degrees), so the holes had to be drilled at the same angle. I played with several wacky (and terrible) ideas for drilling holes at an angle before realizing that the table of my drill press tilted and even had a gauge showing the angle of tilt. Very handy for this sort of thing. I was even smart enough to drill both holes before resetting the table to 90 degrees. Another discovery made during this process was that my new 14" Delta bandsaw can actually use a fence without the blade wandering off to Trenton during the cut. 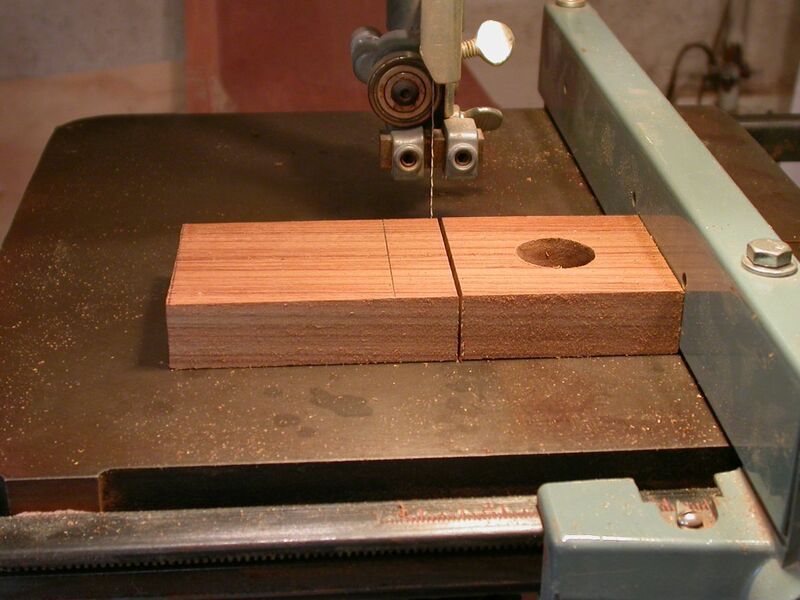 Simple, easy straight cuts on a bandsaw... who would have thunk. 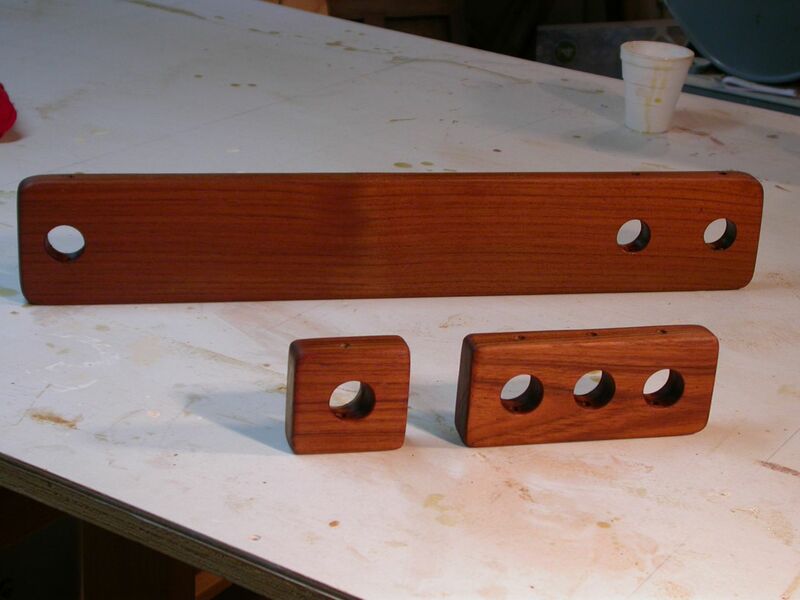 I made the chocks and foot stretcher out of teak (having a vast abundance of free teak in my scrap pile), and time being short, I decided to oil them, rather than varnish them. I think they look pretty good oiled, anyway. Then it was time to assemble on the bench to see if my plan and angles were correct. Amazingly, yes they were! Most plans for root berths just show the pipes laying in the 1" thick chocks, and several people told me that my weight in the bunk would keep them from popping out, but that approach seemed a bit reckless to me. It was all too easy to imagine one of the pipe ends slipping out of the chock, spilling me head-first onto the cabin floor. Instead, I found some 1/4" x 3" hitch pins and drilled holes for them through chocks and pipe. 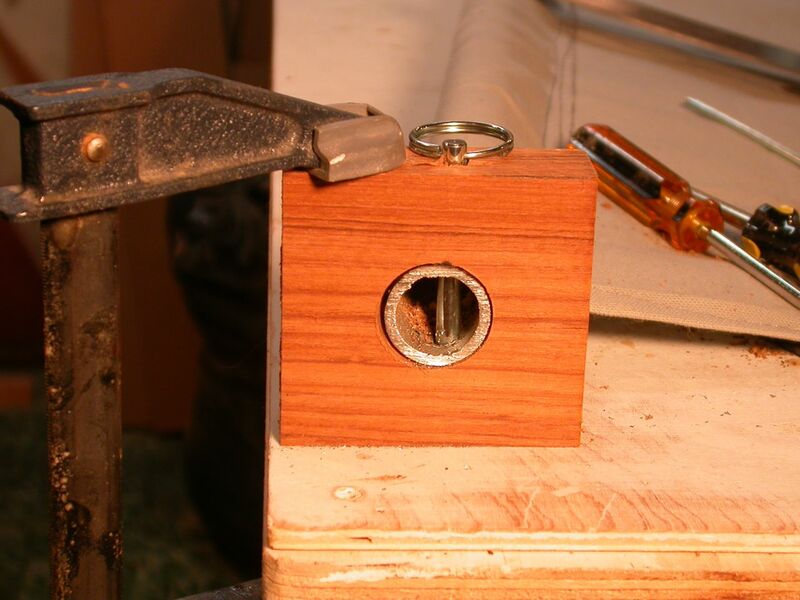 The hitch pins will hold the pipes in place, while being easy to remove for stowage. Finally, it was time to install the chocks on the boat and see how she fit. As you can see in the pics below, the bunk fit perfectly. 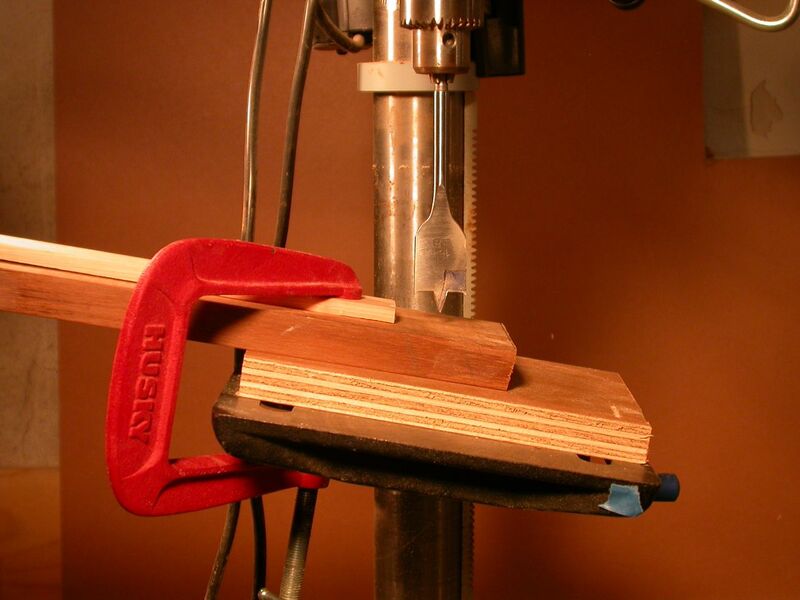 The foot stretcher is held up and against the side of the hull by 1/2" ropes with a rolling hitch, so the height of the stretcher can be easily adjusted. I'll eventually tie eye-splices in the ends of these ropes. And here is the head of the bunk, with the outboard pipe in the most outboard position. Note that there are three holes drilled in the outboard chock. When the pipe is in the one furthest to the left, the berth should be flat. I can add more curve to the bunk by moving the pipe to one of the other holes (and doing the same with the foot stretcher. This will make the bunk safe to sleep in even if the boat is heeled while underway. Assuming I ever need to sleep while underway. Someone with first-hand experience with root and pipe berths told me I should double the material to avoid too much stretch, but did I listen? Of course not. The pic below shows just how much the canvas stretched after I laid in it the first time. Actually, it didn't stretch any more even after spending a night in it, but it just shows how much canvas will stretch when first put under pressure. No matter, this was my 'learning' bunk. 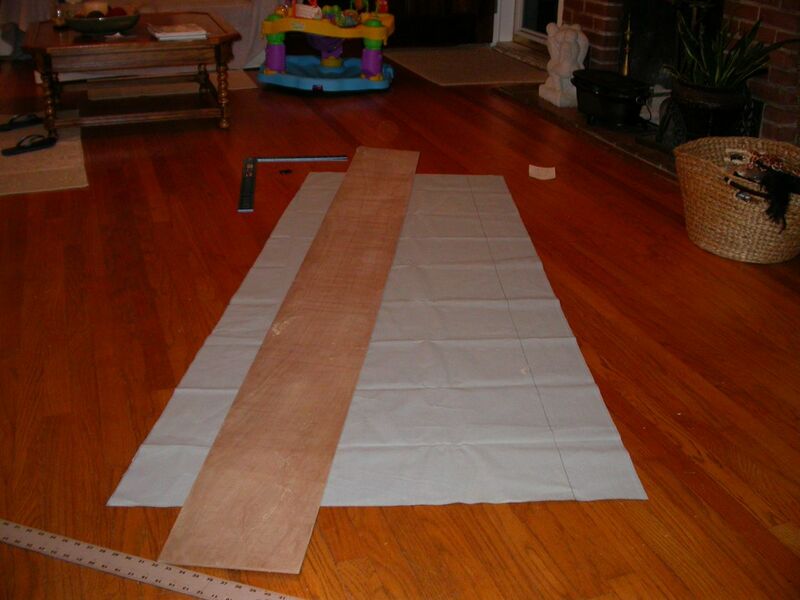 Now that I know about stretching, I'll double-up the material -- or at least re-inforce it under the shoulders and hip area -- and make it about an inch narrower than I want the finished berth to be. That should make it tight in the second hole (at first) and as it stretches, it will be wide enough to be flat in the first hole. And here is the bunk stowed away. 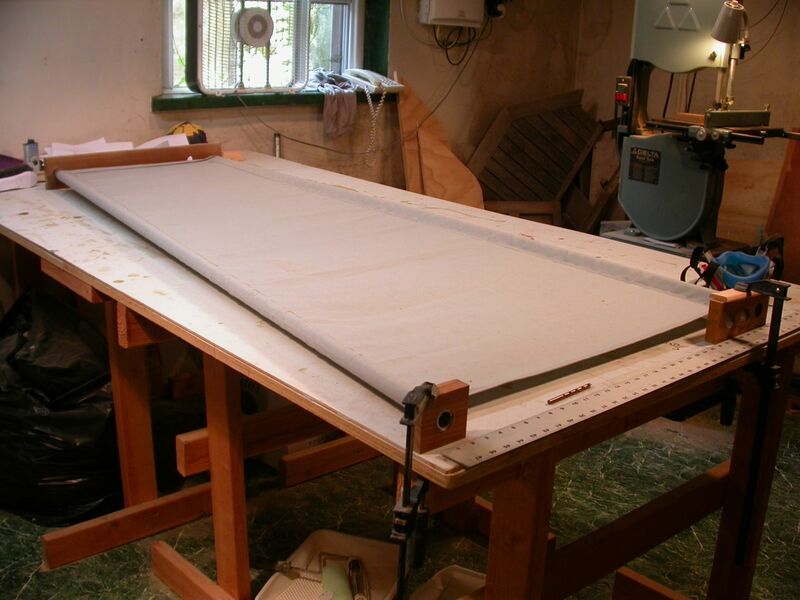 When rolled up, it takes up essentially no space and clears the passage into the foc'sle. Rolls up and out of the way when not in use. Helena and I spent a night aboard to try out the new accommodations, and discovered that both our deck cushions fit side-by-side on the bench to make a comfy little sofa. We put my iPad on the bunk opposite, made some popcorn, and watched a movie in comfort and style. Very nice. These West Marine seats have had a lot of use and abuse, and have held up pretty well. They have new models that look even better. It's great to be able to use them both on deck and down below. Great seats. Deck seats fit side-by-side on bench to make a little love seat. Bunk is folded away behind the seats. 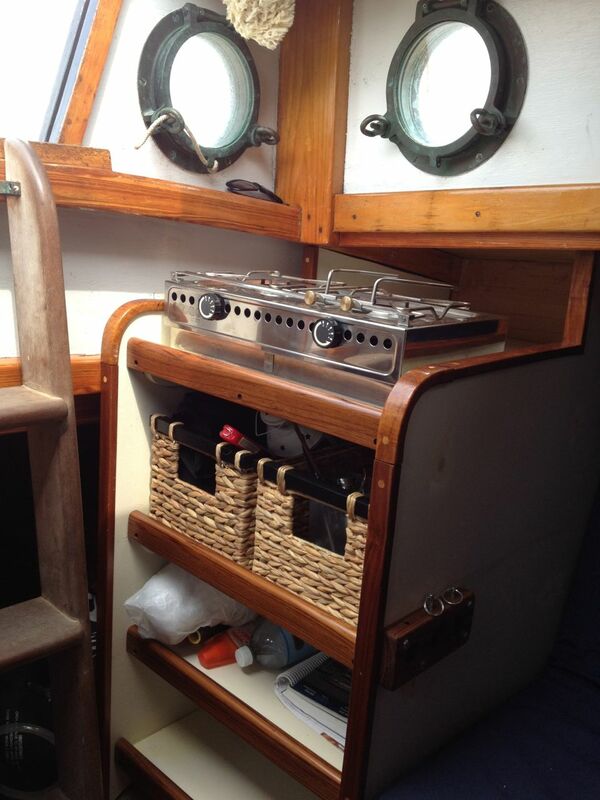 And here is my little galley with baskets holding all sorts of things that I don't want rolling around on the shelves. 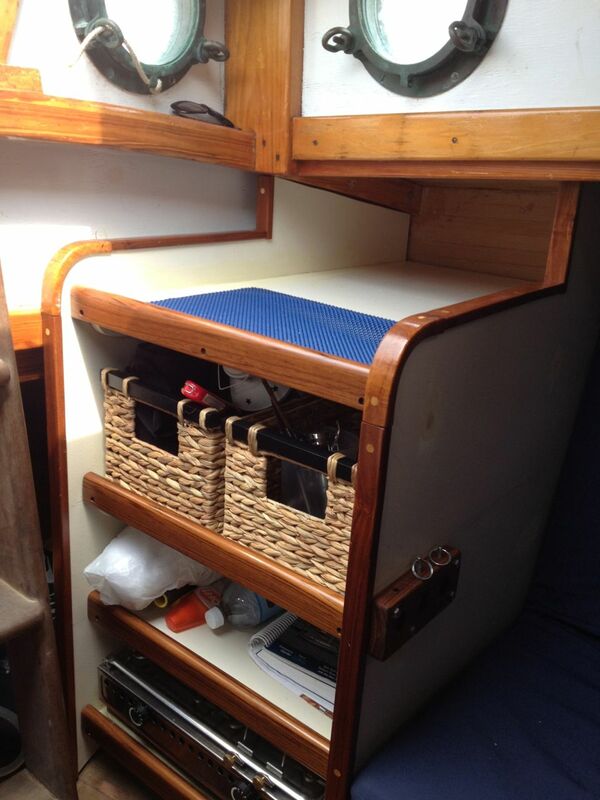 The top and middle shelves are deep enough to hold four 10" x 12" wicker baskets each, with commonly used items in the front baskets, and lesser used items in the inside baskets. I still haven't decided whether to use four 10"x12" or two 20"x12" baskets on the middle shelf, but altogether, the galley can store a whole lot of stuff. Four 10x12" baskets hold everything on top self. Second shelf will hold four additional baskets. 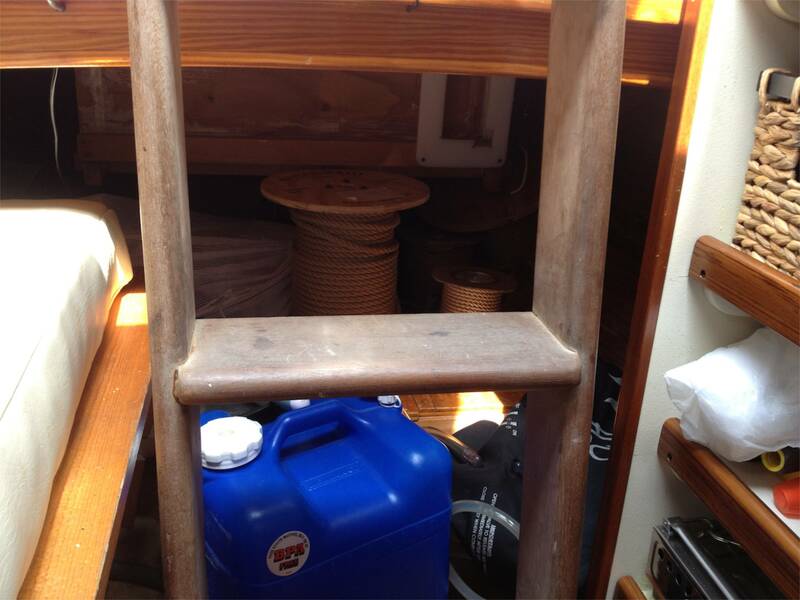 The bottom shelf is dedicated to the stove which will be stowed away when not in use. I plan to build a little cabinet under the deck on the top shelf for plates, cups, silverware, etc. If you're wondering why I call the bow of my boat the foc'sle, the pic below shows why. I need a place to store dock lines, jib sheets, fenders, kedge anchor, etc., etc. It's a bit of a mess at the moment, but I plan to provide nice hooks, etc. to hold all this very necessary clutter. 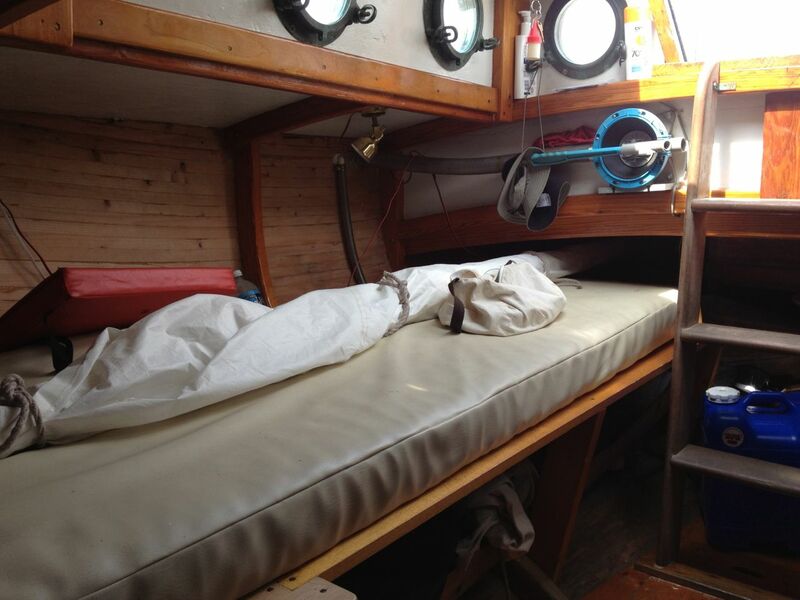 And for the sake of completeness, here's my old bunk with the 4" thick foam mattress, still on the starboard side. It takes up a ridiculous amount of space, but it sure is comfortable for sleeping. Its future is in doubt, though. Stay tuned to see if I eventually replace it, to make room for the wood stove that I really, really want. 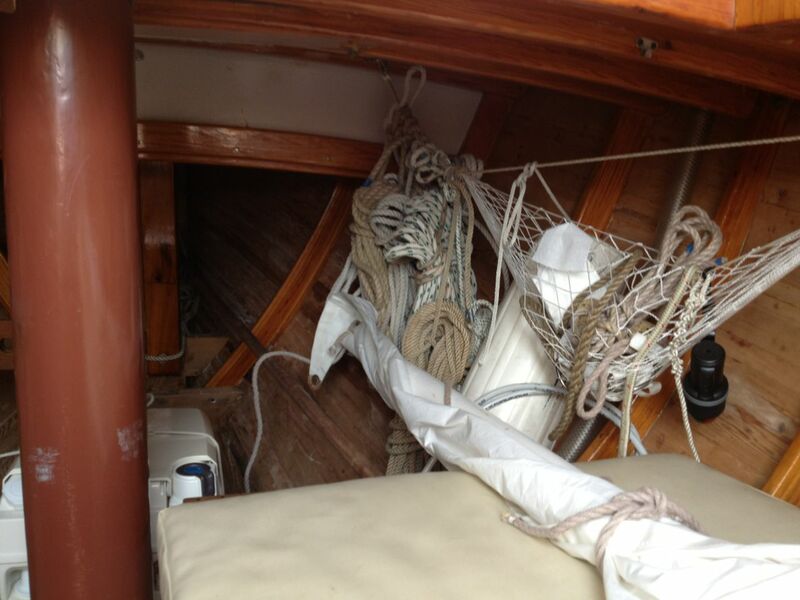 There's also tons of space in the empty engine compartment behind the companionway steps. Someday, I need to do something better with this valuable space. As you can see in some of the photos, I have some sanding and painting to do to clean up some mistakes and finish the job, but apart from that, remodeling is done for this year. It was a heck of a lot of work, but it's great to finally have a little galley, handy storage, sitting headroom, and a second bunk. Helena and I were planning to take the Blue Moon and Cabin Boy on a fall cruise down Long Island Sound and up the Connecticut River, but as I hinted earlier, Fate has intervened with an even more exciting adventure. More on that soon! Old ideas frequently have the great virtue of not only being low tech/simple, but usually work - that's why they are stil around! PS Sad sight this weekend, The Indonesioan sail training ship (Barquentine) Dewaruci arrived in Fremantle having lost her figurehead, whole bowsprit, fore topmast, and everything above it - a steel tubular mast about a foot + diameter bent through 180deg and all hanging down, and also broke both main and mizzen wooden topmasts. On her way to a Cavalcade of Sail in Sydney I believe. The Indian ocean gets very nasty at times! John, I don't know how to do the math on this, but keep in mind that the tighter you keep the cloth, the greater the force the stretcher and galley side have to withstand. The forces can become much greater than the mere weight of the occupant. There must be some sort of published graph or formula giving the resulting increase with the angle the cloth at the pipe makes with the vertical when in use.